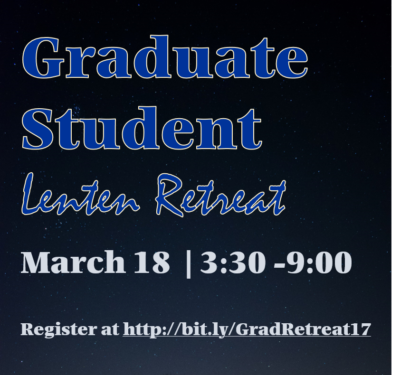 Corpus Christi University Parish invites all UT Graduate students to a Lenten retreat day, March 18 from 3:30 – 9:00 p.m. The day will include dynamic talks by Fr. Phil Smith, Mass, dinner, Confession, and time for personal prayer. Please register by Monday, March 13th at http://bit.ly/GradRetreat17.